North America (September 18, 2017) – Bars and restaurants across the United States are invited to join Brouwerij Bosteels and Artisanal Imports in celebrating Kwaktoberfest. As the name suggests, Kwaktoberfest is a celebration of the iconic Pauwel Kwak beer, with events taking place nationwide throughout October. Participating locations coast-to-coast will serve Bosteels’ Pauwel Kwak in its traditional, instantly recognizable carriage glass, along with the brewery’s other world-class brews including Tripel Karmeliet and DeuS. Special point of sale items will be available for accounts, including flags, coasters, posters, single and double Kwak glasses and the almighty Quattro, capable of holding four Kwak glasses at once. Pauwel Kwak is a Belgian Strong Pale Ale with a rich amber color and slightly sweet, caramel malt character. Hops are subdued with herbal and citrus notes, but present a perfect balance to the juicy ripeness of grain along with fruity kiss and meringue-like softness in body. This 8.4% ABV brew forms a lovely, firm head in the glass and as with all Bosteels’ beers, it is brewed only with natural ingredients: barley malts, mineral water, wheat, hops and white candy sugar. The legendary Kwak glass, or ‘Koetsiersglas’, hearkens back to the Napoleonic era. Back then, Pauwel Kwak was a brewer and owner of the De Hoorn inn, which saw daily visits from mail coaches and their passengers. While passengers could stop in for a drink, coachmen were prohibited from leaving their posts to join. To bypass this inconvenience, Kwak had special glasses blown with a convex bottom that could sit in the coach in a wooden stand, allowing the drivers to enjoy a glass! Regarded as one of the world’s finest Belgian ales, Tripel Karmeliet (Dutch for “Triple Carmelite”) is a golden beer with rich grain character, hints of banana, vanilla, and a pleasing bubble-gum aroma. A restrained hop bitterness offers perfect balance and a gentle counterpart to its substantial maltiness. Launched in 1996 to great acclaim, it is a Belgian Tripel (8.4 % ABV) brewed with barley, wheat and oats. 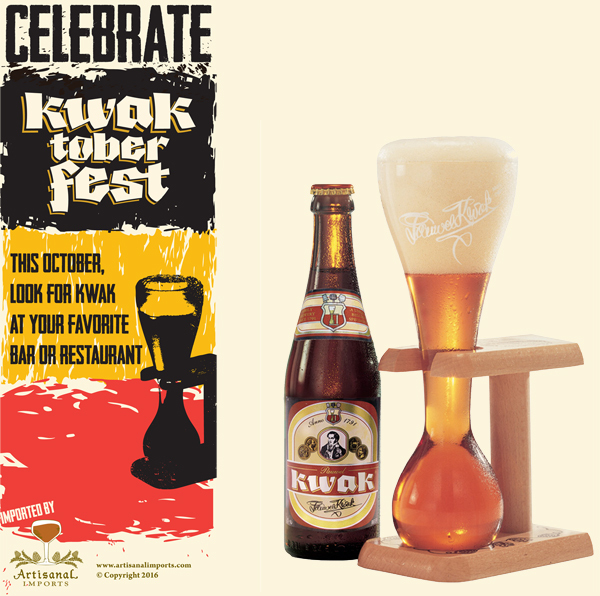 Interested in celebrating Kwaktoberfest at your restaurant, bar or retail store? Please contact Lanny Hoff for specialized event support such as beer, POS and promotional opportunities. For interview opportunities with Brouwerij Bosteels CEO Antoine Bosteels, or for more information about the brewery’s line of beers including Pauwel Kwak, Tripel Karmeliet and DeuS please contact Lanny Hoff at +1 (612) 245-5433 or by email at lanny.hoff@artisanalimports.com. About Brouwerij Bosteels: Brouwerij Bosteels is nestled in the village of Buggenhout, Belgium and is family operated. Located on the same site since 1791, it specializes in unique beers which don’t necessarily align with “normal” Belgian beer styles. Bosteels is one of the best-known special brewers in Belgium with world acclaimed beers such as Kwak, Tripel Karmeliet and DeuS. Learn more about the brewery at www.bestbelgianspecialbeers.be. It appears the descriptions of the kwak and karmeliet are reversed. The banana and vanilla bring morevof the flavors of kwak, and the citrus herbal being more characteristic of the karmeliet. Thank you for your comment. While we appreciate you may have a different experience with Kwak and Karmeliet, the descriptions listed are valid, if not perfect. I guess the only thing we can do is keep trying them!